They have not made a clear cut button on where to play but you can click the link below to play. They will take you through a tutorial when you first enter the game (it's easy) Currently two functions of the game is to upgrade the furniture and to increase the speed of your payout. It seems like those mobile farm/bake/cooking fever kinda game. 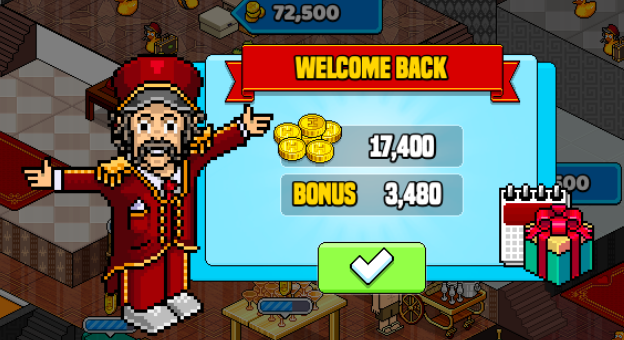 You have to maintain the hotel by upgrading your furni, to earn coins to buy more rooms and new furni. There is a bar at the top, to fill it up you have to purchase all the rooms. And if you click on the left it also shows a bar. Each time you click on New Suite at the top, your bar will increase. Does it save your game? Yes it does save the game and when you return there's a possible bonus. WARNING: Do not delete your cache for Kizi/Habbo Clicker, you'll delete your progress! Post in the comments and let us know if you're liking this game. Is this like, a tester for html5 potential version of habbo??? Seems like it. Giving it a go now! Hmm why never load I also don't know Ryu. How R-yu. is it just mine that don't load? I will update the guide as I go on.